The Meaco DD122FW Mk4 is ideal for use as a boat dehumidifier or a garage dehumidifier. This unit excels in cold conditions and is a quieter dehumidifier than most refrigerant models. The Meaco DD122FW Mk4 is that comparative rarity among portable dehumidifiers, a machine without a compressor. The moisture in the air is extracted instead by use of a water absorbing material, a desiccant. Absorption in this case describes a chemical process by which water molecules are bound to the surface of the desiccant material. Many materials have desiccant properties but when discussing dehumidifiers the term "desiccant" is reserved for those which absorb large quantities of water in a way that has practical uses for humidity control. Until quite recently this process was only used in dehumidifiers for commercial and industrial applications. Among the advantages of a desiccant dehumidifier are its ability to operate effectively at low temperatures and to remove more water from the air in cool conditions than a refrigerant unit. The disadvantages are the greater energy consumption of these machines and their higher unit cost. In many commercial applications these drawbacks are outweighed by the huge benefits a desiccant dehumidifier can provide but they have made the technology much less attractive for use in the home. Advances in technology have reduced the unit cost to the point where a desiccant unit is no more expensive to buy than a good quality refrigerant equivalent, although still less energy efficient. Offsetting the higher running cost are lower weight and quieter operation, both more highly prized by home users than commercial operators. Unless quieter operation and light weight are your first priorities a refrigerant dehumidifier would usually be the better choice for use in the home but for cool areas such as a garage, or on a boat, this is one of the best dehumidifiers available. We are happy to recommend this dehumidifier to our visitors, particularly for use as a garage dehumidifier or boat dehumidifier. The Meaco DD122FW Mk4 uses a desiccant wheel to remove water from the air. The wheel is made up partly from a desiccant material which is overlaid onto another surface in a way that maximises the surface area of the desiccant. Air is drawn into the dehumidifier from the area being dehumidified and the water molecules are "captured" by the desiccant. During each rotation of the wheel a portion of it passes through a stream of warm air generated by the dehumidifier. The heat from the air provides enough energy to "release" the water molecules from the desiccant and this water is collected in a bucket in much the same way as with a refrigerant dehumidifier. In this way the desiccant is "reactivated" or, in layman's terms, dried, so that it will absorb more water during the next cycle. The desiccant wheel is not degraded by this cycle and may be expected to last for the life-time of the dehumidifier. The Meaco DD122FW Mk4 is capable of removing 7 litres of water per day from the air at a temperature of 20°C and 60% relative humidity. This appears to be very low when compared with a refrigerant dehumidifier of, say 20 litres per day capacity but it should be noted that the moisture extraction rates for refrigerant dehumidifiers sold in the UK are typically obtained at 30°C and at 80%RH. Since extraction rates decline as temperature and/or relative humidity fall the claim that this unit is equivalent in drying power to a 20 litre refrigerant machine is credible. At lower temperatures, below 15°C, this dehumidifier will be more effective than a refrigerant model with a larger stated water removal capacity. Desiccant dehumidifiers have been used by industrial and commercial operators requiring one or both of their two major advantages over refrigerant units. First, the capability of a desiccant dehumidifier to perform effectively at low temperatures and second, the capability to dry air to lower humidity levels than a refrigerant dehumidifier. The Meaco DD122FW Mk4 is most certainly capable of low temperature operation. Because it does not use a refrigeration process to condense moisture from the air it does not suffer from ice formation within the unit which so seriously degrades the performance of the more familiar refrigerant dehumidifier. Unless it is fitted with an active defrost system a refrigerant dehumidifier is largely ineffective in the lower temperature ranges. The Meaco DD122FW Mk4 will also continue to reduce relative humidity to levels refrigerant dehumidifiers designed for use in residential applications cannot achieve. This may be of benefit users who need a dehumidifier to keep a storage area at around 40% RH although such a level would not be necessary in living areas of the home. While the DD122FW Mk4 will certainly control relative humidity at temperatures down to 1°C the claim that this unit will extract 7 litres per day, regardless of the temperature, does not correspond with the published performance data for commercial and industrial desiccant dehumidifiers. Manufacturers of these units publish tables charting the fall in extraction rates as temperature and/or relative humidity fall. As the technology is fundamentally identical it casts doubt on claims made in respect of desiccant dehumidifiers for home use. We will be more than happy to withdraw this reservation should any compelling evidence be produced to substantiate such claims. Leaving aside the question of unchanging moisture extraction rates it remains the case that the Meaco DD122FW Mk4 is far better suited for dehumidification in temperatures approaching freezing point than most refrigerant dehumidifiers. Another unequivocal advantage of the Meaco DD122FW Mk4 is its light weight. The omission of a compressor allows a considerable weight reduction and this unit weighs a very manageable 6Kg. It is very easy to move using the top mounted carrying handle which will be appreciated by anyone who has used a refrigerant dehumidifier. The DD122FW Mk4 is also a compact dehumidifier with external dimensions of just 29 x 17.5 x 47.5cm. With such a small foot-print this unit is well suited for use in areas where floor space is limited. The water collection container, or bucket, has a capacity of 2 litres. This bucket has to be emptied regularly as once full the dehumdifier switches off to prevent spillage. As a means of avoiding this chore the unit is configured for continuous drainage. A small bore plastic pipe may be attached to the dehumidifier and run to a convenient drain to discharge the water as it collects. This is a gravity feed so the drain must be lower than the outlet port in the dehumidifier and within a few feet of the dehumidifier. The Meaco DD122FW Mk4 is a relatively quiet dehumidifier and this is another benefit of the omission of a compressor. The compressor is the lesser of two sources of noise from a refrigerant dehumidifier, the other being the fan. Unfortunately desiccant dehumidifiers also need fans and therefore noise is inescapable. The DD122FW Mk4 has variable fan speeds which operate in accordance with the selected operating mode. At the lowest fan speed the unit is only producing 34dB but at the highest setting, laundry mode, this rises to 48dB. Both are relatively quiet for a dehumidifier but some users report that the higher speed can be intrusive. The goal of a dehumidifier that is both effective and quiet remains elusive. One consequence of the use of desiccant technology in a dehumidifier is that the air expelled from the unit is considerably warmer than the air that is drawn in, about 10 - 12°C. This is because heated air is used to reactivate the desiccant wheel, as mentioned above. This can be an advantage in cold weather as it reduces heating costs inside the home and is of particular value if the main use of the dehumidifier is drying laundry when it cannot be dried outside. The warm air is also an advantage in cold areas, such as a garage, where warming the air reduces relative humidity and, therefore, lowers the risk of condensation formation. If the dehumidifier is to be used to make a warm, clammy night more bearable, however, it is clearly a disadvantage. The other disadvantage of a desiccant dehumidifier is its higher energy consumption, compared with an equivalent refrigerant machine. The choice you make between a desiccant dehumidifier and a refrigerant model will depend upon your priorities. If your need for a dehumidifier is in a cold garage, or perhaps a boat, there is no contest; the Meaco DD122FW Mk4 will provide superior performance every time. Within the home this unit will have appeal for those who use a dehumidifier mainly when the weather is cool. The lower noise level, lighter weight, compact dimensions and heating effect of this unit may be attractive. For use in warm weather a refrigerant model will be just as effective, cheaper to run and will discharge air only a couple of degrees warmer than the ambient temperature. Consumers are generally pleased with this dehumidifier particularly if their humidity problem is in a cool area which is not too large. There is less satisfaction among those who have bought this unit for use as a general house dehumidifier as its capacity is less than would be required to keeep a large area dry. 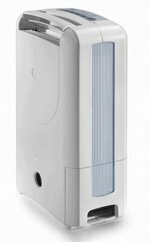 This is of concern to allergy sufferers who need a dehumidifier which can control relative humidity in the 45% to 50% range. A number reviewers have commented that for larger areas, within the home, a refrigerant dehumidifier would be more suitable. Those who have used this unit in garages, sheds, garden offices, conservatories, boats and garages have been extremely pleased with its performance and reliability. Opinions vary about the noise level produced by this dehumidifier. Most agree that on the low fan speed setting it is quiet but a majority find the noise on the higher setting intrusive. This reinforces the point that a dehumidifier should not be expected to perform well in an area that is too large. A properly sized dehumidifier should not have to run on the higher fan speed setting for significant portions of the day. The compact dimensions and low weight of this dehumidifier are universally praised. We do not believe that this is the most suitable dehumidifier for use in the home. Refrigerant dehumidifiers are cheaper to run and will remove more water at typical room temperatures. For cooler areas of fairly small size the Meaco DD122FW MK4 Dehumidifier cannot be beaten by refrigerant dehumidifiers. In a garage, an unheated conservatory, a boat or a similar area this unit will be considerably more effective than the typical home dehumidifier. Only a refrigerant dehumidifier with "hot gas defrost" can offer similar performance and the few available models are considerably more expensive than the Meaco DD122FW MK4. For this type of environment we recommend this dehumidifier without reservation.